'Tis the season of eating, and with the arrival of fall comes a harvest of new eateries spicing up the dining scene from London to LA. You starved all summer in LA, but now is the time to indulge at Curtis Stone's new Gwen. A carnivore sequel to his highly successful Maude, this prix-fixe restaurant and butcher shop requires a pricey ticket booked a month in advance or on last-minute basis. Chicago hotspot The Loyalist gets a gourmand sibling in Smyth, an 8-course dining experience inspired by the Virginia countryside. In Miami, Zika is no deterrent for diners lining-up for new Quinto La Huella that brings Uruguay's beach club scene and its ubiquitous parilla wood grill to the new East Miami. 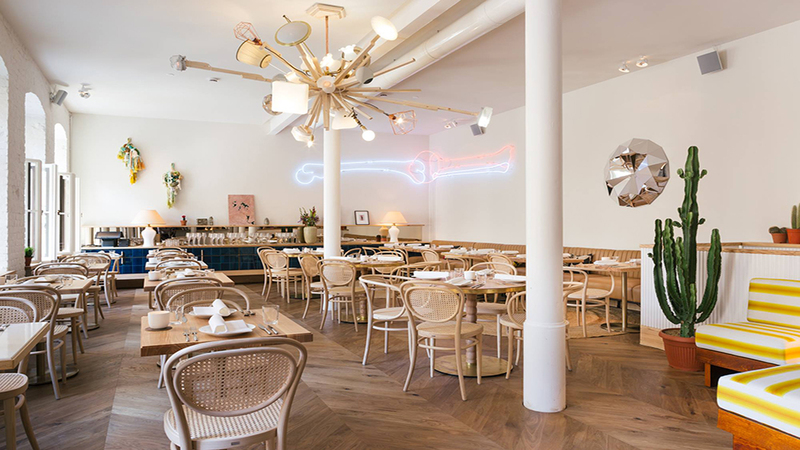 New York gets a boost with Casa Apicii, a tasty Italian trattoria inside a Greenwich Village townhouse by the chef of LA's acclaimed The Tasting Kitchen while nearby Ladybird does truly innovative, globally inspired vegetable tapas. And while everyone is clammering to get to the new Eataly downtown, it’s really Japan-born TsuruTonTan that is worth talking about and it’s that amazing udon and cod caviar that's worth the 2-hour wait. London's Michelin star scene is shaken-up this season with the arrival of Eneko at One Aldwych Hotel. Helmed by Chef Eneko Atxa, formerly of Azurmendi in Bilbao, Eneko at One Aldwych will serve Basque cuisine from its soon-to-be awarded dining room with mezzanine wine bar perfect for pre-theater dinning. A bit more playful, Dirty Bones arrives to Shoreditch serving-up American comfort food and nightly hip-hop DJs that have become all the rage. In Berlin, Oh-Panama (pictured) does a whimsical eatery worthy of the children's song it's named after with curated art program and mixology bar on Potsdamer Strasse. In Paris, big name chefs are headlining again at more casual eateries like Champeaux in the 1st by Alain Ducasse and new La Galerie at the reopened Ritz. Otherwise, head over to the new Matsuhisa inside Le Royal Monceau that’s currently the trendiest sushi bar in town.